Breadfruit (Artocarpus altilis) is a species of flowering tree in the mulberry family, Moraceae, that is native to the Malay Peninsula and western Pacific islands. It has also been widely planted in tropical regions elsewhere. Breadfruit trees grow to a height of 20 meters (66 ft). The large and thick leaves are deeply cut into pinnate lobes. All parts of the tree yield latex, a milky juice, which is useful for boat caulking. The trees are monoecious, with male and female flowers growing on the same tree. The male flowers emerge first, followed shortly afterward by the female flowers, which grow into a capitulum, which are capable of pollination just three days later. The pollinators are Old World fruit bats in the family Pteropodidae. The compound, false fruit develops from the swollen perianth and originates from 1,500-2,000 flowers. These are visible on the skin of the fruit as hexagon-like disks. 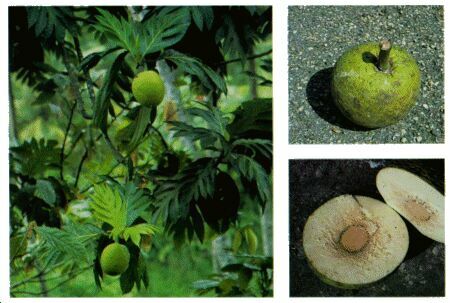 Breadfruit is one of the highest-yielding food plants, with a single tree producing up to 200 or more fruits per season. In the South Pacific, the trees yield 50 to 150 fruits per year. In southern India, normal production is 150 to 200 fruits annually. Productivity varies between wet and dry areas. In the Caribbean, a conservative estimate is 25 fruits per tree. Studies in Barbados indicate a reasonable potential of 6.7 to 13.4 tons per acre (16-32 tons/ha). The grapefruit-sized ovoid fruit has a rough surface, and each fruit is divided into many achenes, each achene surrounded by a fleshy perianth and growing on a fleshy receptacle. Some selectively-bred cultivars have seedless fruit. 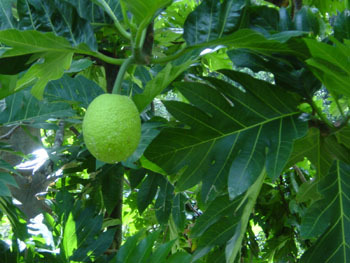 The breadfruit is closely related to the breadnut and the jackfruit. Breadfruit is an equatorial lowland species that grows best below elevations of 650 metres (2,100 ft), but is found at elevations of 1,550 metres (5,100 ft). Its preferred rainfall is 1,500–3,000 millimetres (59–120 in) per year. Preferred soils are neutral to alkaline (pH of 6.1-7.4) and either sand, sandy loam, loam, or sandy clay loam. 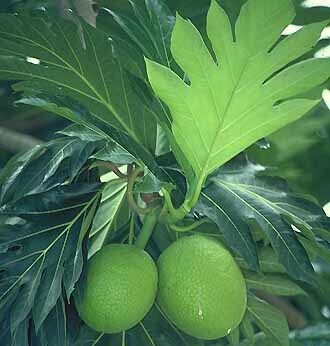 Breadfruit is able to grow in coral sands and saline soils. Because breadfruit trees usually produce large crops at certain times of the year, preservation is an issue. One traditional preservation technique is to bury peeled and washed fruits in a leaf-lined pit where they ferment over several weeks and produce a sour, sticky paste. So stored, the product may last a year or more, and some pits are reported to have produced edible contents more than 20 years later. Fermented breadfruit mash goes by many names such as mahr, ma, masi, furo, and bwiru, among others. The Hawaiian staple food called poi made of mashed taro root is easily substituted or augmented with mashed breadfruit. The resulting “breadfruit poi” is called poi ʻulu. In Puerto Rico it is called "panapen" or "pana", for short. Breadfruit is roughly 25% carbohydrates and 70% water. It has an average amount of vitamin C (20 mg/100g) and small amounts of minerals (potassium and zinc) and thiamin (100 μg). Breadfruit was widely and diversely used among Pacific Islanders. Its lightweight wood (specific gravity of 0.27) is resistant to termites and shipworms, and consequently was used as timber for structures and outrigger canoes. Its wood pulp can also be used to make paper, called breadfruit tapa. It is also used in traditional medicine to treat illnesses that range from sore eyes to sciatica. In a late-18th-century quest for cheap, high-energy food sources for British slaves in the Caribbean, William Bligh, Commanding Lieutenant of the HMS Bounty, collected and distributed botanical samples of breadfruit. Other sources say Captain James Cook was the first to introduce the South Pacific native plant to the Caribbean islands. According to an etiological Hawaiian myth, the breadfruit originated from the sacrifice of the war god Kū. After deciding to live secretly among mortals as a farmer, Kū married and had children. He and his family lived happily until a famine seized their island. When he could no longer bear to watch his children suffer, Kū told his wife that he could deliver them from starvation, but to do so he would have to leave them. Reluctantly, she agreed, and at her word, Kū descended into the ground right where he had stood until only the top of his head was visible. His family waited around the spot he had last been day and night, watering it with their tears until suddenly a small green shoot appeared where Kū had stood. Quickly, the shoot grew into a tall and leafy tree that was laden with heavy breadfruits that Kū's family and neighbors gratefully ate, joyfully saved from starvation. Though they are widely distributed throughout the Pacific, many breadfruit hybrids and cultivars are seedless or otherwise biologically incapable of naturally dispersing long distances. Therefore, their distribution in the Pacific was clearly enabled by humans, specifically prehistoric groups who colonized the Pacific Islands. To investigate the patterns of human migration throughout the Pacific, scientists have used molecular dating of breadfruit hybrids and cultivars in concert with anthropological data. Results support the west-to-east migration hypothesis, in which the Lapita people are thought to have traveled from Melanesia to numerous Polynesian islands. The world’s largest collection of breadfruit varieties has been established by botanist Diane Ragone, from over twenty years' travel to fifty Pacific islands, on a 10-acre plot outside of Hana, Hawaii on the isolated east coast of Maui. 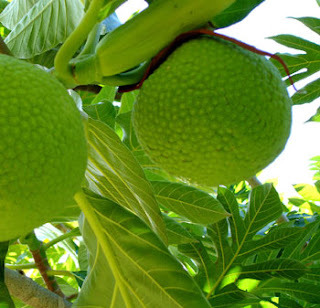 Breadfruit trees grow to a height of about 20 meters (66 ft). The leaves are large, thick and are deeply cut into pinnate lobes. All parts of the tree, including the unripe fruit, are rich in milky juice, gummy latex, which is useful for boat caulking. 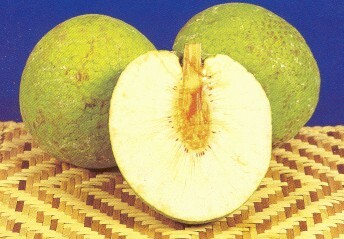 The breadfruit is closely related to the breadnut and the jackfruit. Breadfruit can be eaten at all stages of maturity when they are roasted, baked, fried, or boiled. They are rich in startch and when cooked the taste is very similar to potato-like, or fresh baked bread. One of the fermentation technique is to bury peeled and washed fruits in a leaf-lined pit over several weeks and produce a sour, sticky paste. Fermented stored breadfruit may last a year or more. Fully ripe fruits that have harvested from the tree can be wrapped in polyethylene, or put into polyethylene bags, and can be kept for upto 10 days in storage at a temperature of 53.6'F (12'C). At lower temperature, the fruit may be damaged by chilling injury. Slightly unripe fruits that have been caught by hand when knocked down can be maintained for 15 days under the same conditions. The thickness of the polyethylene used to keep the fruit should be atleast equal or greater than 38 or even 50 micrometer. A common product is a mixture of cooked or fermented breadfruit mash mixed with coconut milk and baked in banana leaves. Whole fruits can be cooked in an open fire, then cored and filled with coconut milk, sugar and butter, cooked meats, or other fruits. The filled fruit can be then cooked so that the flavor of the filling permeates the flesh of the breadfruit. The pulp scraped from soft, ripe breadfruits is combined with coconut milk, salt and sugar and baked to make a pudding. A more elaborate dessert is concocted of mashed ripe breadfruit, with butter, 2 beaten eggs, sugar, nutmeg, cinnamon and rosewater, a dash of sherry or brandy, blended and boiled. Breadfruit is also candied, or sometimes prepared as a sweet pickle. The original method of making POI involved peeling, washing and halving the breadfruit, discarding the core, placing the fruits in stone pits lined with leaves of Cordylme terminalis Kunth, alternating the layers of fruit with old fermented pod, covering the upper layer with leaves, topping the pit with soil and rocks and leaving the contents to ferment, which acidifies and preserves the breadfruit for several years. In Barbados and Brazil there is a way to substituting breadfruit in part for wheat flour in breadmaking, and it called Breadfruit flour. Breadfruit flour is much richer than wheat flour in lysine and other essential amino acids. This new combination has been found more nutritious than wheat flour alone. The seeds from the breadfruit are boiled, steamed, roasted over a fire or in hot coals and eaten with salt. It's lightweight wood is highly resistant to termites and shipworms. Its wood pulp can also be used to make paper. The wood pulp is also used in traditional medicine to treat illnesses that range from sore eyes to sciatica. Fiber from the bark is highly durable but difficult to extract. Malaysians fashioned it into clothing. Material for tape cloth is obtained from the inner bark of young trees and branches. Breadfruit is a relatively good source of iron, calcium, potassium, riboflavin, and niacin. The mature fruit is high in carbohydrates, low in fat and protein, and a good source of minerals and vitamins, especially B vitamins. The nutritional composition of breadfruit varies depending on the ripeness of the fruit as ripe breadfruit is more nutritious. Decoction of the breadfruit leaf is believed to lower blood pressure, and is also said to relieve asthma. Crushed leaves are applied on the tongue as a treatment for thrush. Ashes from burned leaves are used on skin infections. A powder of roasted leaves is employed as a home remedy for enlarged spleen. Toasted flowers are rubbed on the gums around an aching tooth. The latex is used on skin diseases and is bandaged on the spine to relieve sciatica. Diluted latex is taken internally to overcome diarrhea.